The compition within communication and computer electronics enterprise has been global and crucial ever since. Product renew is sooner, life cycle is otherwise shorter. The situation of enterprise compition become so severe that even cost reduction or inexpensive manpower are no longer predominated. It is worthy to note that knowledge-based industrial nowaday follow the leading thoughts to improve their performance. I.e.,enterprise resource planning, the 'erp' ,material requirement planning, the 'mrp' , manufacturing resource planning, the 'mrpll' , To integrate advanced technology and to have their policy. It is recognized by Atom Electronics Co., Ltd ., the said 'mrp' is the controlling factor to manufacturer to lift the company compition. Atom pursuits to play an active trader on the supply chains, steadily to help the customer to improve their compition. As being an active trader in the fieeld of passive devices commerce, Atom recognizes that to provide keen market information, knowledge and material, is the duty to trader. Trader learns the best . Trader make the market go. And thus make the profit possible. Atom will be fully devoted to be an active trader to provide service to manufacturer to make sure the company keep in growing, Atom will also persist to seek high class manpower to have the sales team worked highly effective and energized. The above products are all furnished by premier manufacturers with ISO 9002 certificates. As heading to multiple product marketing, Atom will provide services of knowledge and material steadily. It is anticipated that to create splendid sales revenues and share it with our fully devoted colleagues in the near future. Metal Oxide Varistors Varistors are voltage dependent, nonlinear devices which have an electrical behavior similar to back-to-back zener diodes. The symmetrical, sharp breakdown characteristics enable the varistor to provide excellent transient suppression performance. When exposed to high voltage transients the varistor impedance changes many orders of magnitude from a near open circuit to a highly conductive level, thus clamping the transient voltage to a safe level. The potentially destructive energy of the incoming transient pulse is absorbed by the varistor, thereby protecting vulnerable circuit components. PPTC Polymeric Positive Temperature Coefficient Thermistor (PPTC) is made of crystalline conductive polymer composite material. In the normal working condition, the conductive fillers in the composite matrix form a continuous filler network and the resistance of the device is in the low resistance state. In the abnormal condition, the current flowing though the device is higher than the trip current, the device is heated up to a state that the connected filler network breaks down. Then the resistance of the device increases dramatically to the high resistance state and the current flowing through the circuit is reduced. Once the abnormal condition is reset, the device cools down, and the filler network connects again and the device returns to its low resistance state. High Voltage Chip Capacitor High voltage chip capacitors are manufactured with modern proven technologies exchanged with a Japan-based manufacturer. The process features a high degree of mechanized operations under precise control while also using the highest quality materials. A continuous quality assurance program is also maintained to ensure consistent high quality capacitors. Inductor A passive component designed to resist changes in current. Inductors are often referred to as "AC Resistor". The ability to resist changes in current and the ability to store energy in its magnetic field, account for the bulk of the useful properties of inductors. Current passing through an inductor will produce a magnetic field. A changing magnetic field induces a voltage which opposes the field-producing current. This property of impending changes of current is known as inductance. 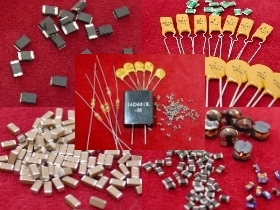 Diodes Rectifier diodes are used in consumer and industrial applications. Rectifier includes General Purpose, Fast Recovery, Ultra Fast Recovery, Super Fast Recovery, and Efficient Fast Recovery. Schottky Barrier Diodes are ideal for personal computers, digital cameras, PDAs, pagers and portable devices. Extremely low drop-down voltage (VF) extends battery life and is one of the key features of these diodes. 10Fl., No. 65, Sec. 2, Chien Kuo North Rd., Tiapei, Taiwan, R.O.C.